While the white men at NASA were busy figuring out the challenges of managing outer space, there were a few black women assisting them with that tall task while also worrying about the challenges of managing office space. That's the crux of Hidden Figures, a breezy and inspiring film about three intelligent ladies having to contend with both sexism and racism as they became personally involved in the Space Race that found the U.S. competing with the Soviet Union during the Cold War. 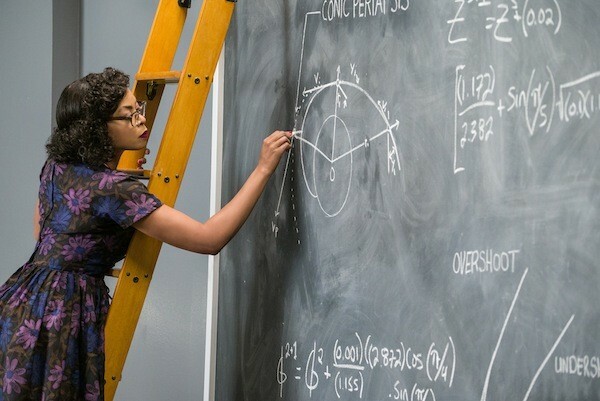 Based on Margot Lee Shetterly's nonfiction book, Hidden Figures places Katherine Johnson (Taraji P. Henson) at the forefront, relating how she was tapped for her skills as a mathematician to help NASA's Space Task Group (headed by Kevin Costner's tough but fair director) crunch the numbers needed to successfully send astronaut John Glenn (winningly played by Glen Powell) into space and have him safely return to Earth. As Katherine copes with prejudice on various fronts, her best friends and colleagues Dorothy Vaughan (Octavia Spencer) and Mary Jackson (Janelle Monáe) are having equal difficulty in finding ways to advance in a society that frowns disapprovingly upon their skin color.